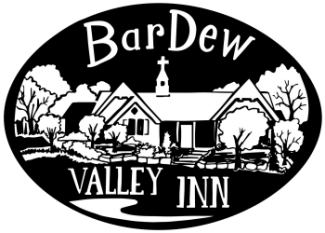 Here at the Bardew Valley Inn, we like to make newcomers feel at home; we want to make strangers feel like family, and family feel like friends. With this mission in mind, we wanted to be able to make this atmosphere tangible. The Cowboy Suite at the BarDew Valley Inn embodies, yet redefines southern hospitality. This attitude of amiability and comfort is embedded into the very core of this room, with its wooded views and snug ambiance, your vacation will not only be homelike, but cherishable. They say there is no place like home, or nothing like a good country song in the summer (both of which, I agree with). Inexplicably, the Cowboy Suite exerts that same spirit. Discover romance in the king-sized bed overlooking french doors to your private patio. The large private boudoir bathroom features a clawfoot slipper tub, a walk-in shower, and a double vanity. This suite is the epitome of Southern Charm. Come experience it for yourself! Our trip far exceeded our expectations. Bardew is beautiful. And Perry and Beth were exceptional hosts. Very helpful with where to go and what to see in the area. We loved Oklahoma and look forward to visiting again. We will definitely stay at Bardew and recommend to all. The BarDew Valley Inn is one of a kind and truly unique. When we arrived we were blown away, much more than we expected. The quiet picturesque setting, the unique rooms and bathrooms, the theatre room, the private entry to each room, the small details- if you're looking for somewhere to stay, this is the place! BarDew Valley Inn is such a unique B&B. From the picturesque quiet setting to the unique rooms, private entry, and great hosts. Everything was above and beyond what we expected!